Memphis is known for its booming live music scene. It is the city, after all, that discovered and raised Elvis Presley and B.B. King. You can hear old and new stars perform here any night of the week. Some music establishments are legendary and have incredible history behind them while other newer ones are bringing a fresh vibe to the music scene. Regardless, fans of live music will have a great time exploring this town. While there are B.B. King's Blues Clubs located all over the country, this is the original. 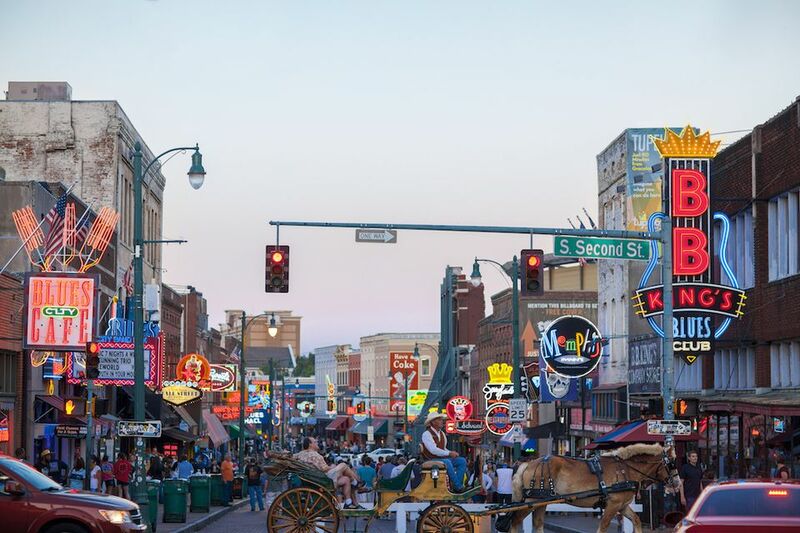 Located at the top of Beale Street, it's a Memphis icon, a place that shaped the city. Here you'll discover the next generation of Blues stars as well as those paving the way in soul and rock 'n' roll. The club also serves mouth-watering barbecue and delicious cocktails to get you in the mood to party. No matter who is on the line-up for the evening, you'll want to be here all night long. The Handy Park Pavilion, located at the center of Beale Street, is named for W.C. Handy, "Father of the Blues." It's a public venue where anyone can come to listen to live performances most days of the week. More established musicians play on the larger stage while the smaller performance area is reserved for up-and-comers. In the afternoons anyone can take the stage to strut their stuff to the world. Blues City Cafe, another Beale Street establishment, has earned worldwide fame not only for their ribs but also for the energetic and impressive live shows in their Band Box. It's an old school joint where you sit around wooden tables surrounding the stage. You're close to the performers, and can see them put their soul into it. Blues City never fails to entertain with lots of Memphis talent and Memphis-themed acts. One of their most popular acts is Freeworld, a jazz funk fusion band that has become a Memphis music staple. The original Lafayette's Music Room in Overton Square made a name for itself in the '70s by discovering the next stars. Bill Joel, KISS, Barry Manilow—they all entertained here first. Now the music hall is open again with live music seven days a week. On weekends there are often two different acts, one at brunch time and one at dinner. The setting is relaxed and fun; you can order a locally brewed beer and nachos to your seat. There is waiter service and a full menu. The Center for Southern Folklore in downtown Memphis has a simple mission: to celebrate the arts, music, and heritage of the south. And a key part of that is live music. Around once a week (sometimes more), the center holds concerts from musicians all over the south. There are rock bands, funk bands, singer-songwriters, country musicians, and more. The concerts take place in an indoor room with perfect acoustics and colorful murals on the wall. It's an experience you won't forget. Newby's is primarily a college hangout and a Memphis fixture on the Highland strip. But the shows they host are surprisingly mature for a college bar. Musical acts cover a wide range of styles, including country, blues, and rock.The impressive Mojo Possum, who can best be described as an experimental-jazz-funk jam band, is a regular. If you're beyond college age, Newby's is like a time rewind, but the cover and beer is cheap. And the music is worth it. The tagline says it all: "Keeping the Party Going." Minglewood Hall used to be a former bread factory in a forsaken place in midtown Memphis. Now, it's one of the most popular venues for concerts in a hip part of town. It has a huge indoor and outdoor plaza where big-name acts play when they're in town. But the best part is the 1884 lounge, a smaller, semi-chic area that hosts some of the best local/regional music in the MidSouth. There are old record labels on the wall, and a bar that serves local brews. For show and ticket details, check out the Minglewood Hall website. Young Avenue Deli is a lively spot in the hip Cooper-Young neighborhood of Midtown Memphis. It's somewhat of a throwback bar. You'll find Midtown hippies mixing with young professionals; rows of pool tables; and good, greasy sandwiches. It also has an impressive beer list with 36 options on draft and another 130 canned and bottled beer. This bar and deli regularly features live music and sometimes surprises with big-name, fever-inducing shows. Check out the calendar on the website. Railgarten is a sprawling 1.5-acre bar with everything you need for fun. A room full of ping pong tables? Check. An absinthe bar? Check. Tiki drinks? Check. Bonfires and sand pits? They have that too. Railgarten is also one of the city's newest venues to host live concerts. Thousands of people pack into the yard (It's so big that it doesn't feel crowded) and dance to big names like Cowboy Mouth. The venue also takes pride in finding and hosting cover bands, hip-hop collectives, and jazz, folk, and gospel groups. Most of the shows don't even have a cover charge. Those searching for a relaxing non-bar music experience should look no further than the Levitt Shell in Overton Park. This outdoor pavilion is where Elvis Presley performed his first professional concert, and today's talent seeks to live up to that legacy. Performers come from all over the globe to play music of all kinds. There are cultural performers, rock groups, orchestras, swing bands, experimental dancers, and more. All the concerts are free. Arrive early with a picnic and blanket to get a good spot on the grass. Check the schedule on the website.